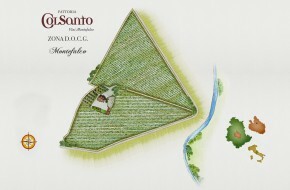 The Fattoria Colsanto estate and winery were established in 2001, in Bavegna a locality within the Montefalco DOCG production area, right in the heart of Umbria. The original eighteenth century farmhouse is surrounded by 20 hectares of vineyards that boast 7500 vines per hectare of Sagrantino, Sangiovese, Montepulciano and Merlot. The completely renovated winery, which features cutting-edge winemaking technology is where 3 very interesting wines are produced: Sangrantino, Montefalco Rosso and Ruris a blend of Sagrantino, Sangiovese and Merlot grapes. There is also a B&B located within the estate. Six beautifully appointed en-suite rooms, each of which offer spectacular views of Spello and Assisi. Wine tastings and local specialities and wine-pairing events are regularly held at the winery. It has an intense ruby red color, with a fruity bouquet, ranging from spices to wild berries. Tannins are soft and the aftertaste is long. The grapes are harvested by hand using boxes followed by gentle destemming. The fermentation takes place at a controlled temperature of 23°C on the skins for fifteen days. There follows the malolactic fermentation, 70% inside the barriques and 30% in steel tanks. Ten months of maturing follow, 70% in barriques and 30% of the product in steel tanks. At the end of this period, the wine is assembled and bottled. Drink with: pasta dishes with ragout, all types of meat and poultry, mature cheeses.